Fran Kelly is off to join the re-invasion at Gallipoli next week. So the count-down begins and pent-up excitement at the ABC could hardly be greater. Imagine if the ‘official broadcaster’ chosen for the centenary had been one of the commercials, and if they had used it for long, tasteless ad-breaks for all the Aussie icons like Rosella, Vegemite, Speedo, Holden, and Anzac ‘cookies’ − all now gone, or under foreign control. But the ABC is doing its best to make up for the absence of commercial nostalgia with long, tasteless ad-breaks for its own coverage of the event. They focus on young Australians for whom, apparently, going to Gallipoli is cool. In the interests of honest historians I made myself watch Four Corners on 13 April, fearing the worst. Chris Masters emerged to re-run selections from his past interviews with old Diggers, all of whom are now dead, intercut with photos of the landing, the trenches, the clifftop, and the retreat. The Anzacs were keen, patriotic and not nervous, according to one man interviewed, even when they went over the top into the gunfire. One in five was born in the United Kingdom. But another admitted to seeing men injure themselves in order to be withdrawn. 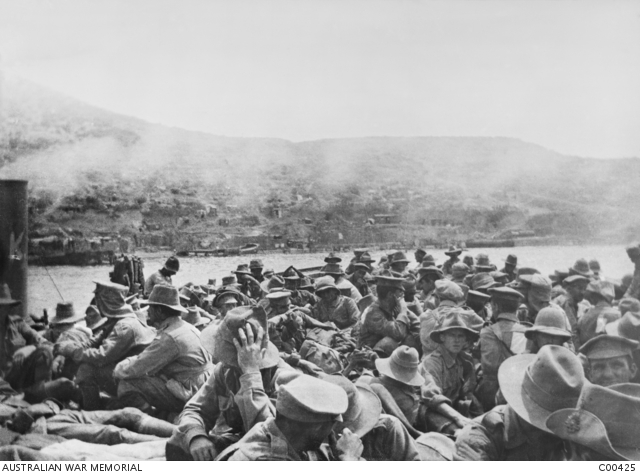 Masters’ starting point is that the Gallipoli story is more familiar to most Australians than Afghanistan. He is walked through the Australian War Memorial by its Director, Brendan Nelson, who points out how close the new Afghanistan room is to the World War I displays. It’s less about war, he says, offering the new linkage, than about friendship and love. Masters then interviews James Brown, ex-Army, now at the University of Sydney via the Lowy Institute, about the differences between the two wars. Compared with the books and films about eight months at Gallipoli, says Brown, there’s almost no narrative about Australia’s 14 years in Afghanistan. 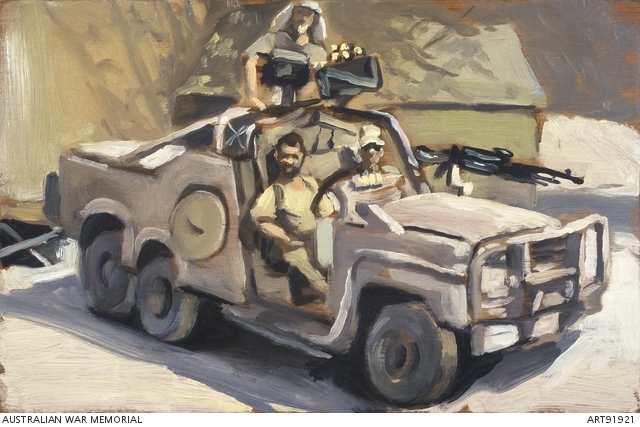 Ben Quilty’s paintings loom over the Afghanistan display at the War Memorial, but no official war correspondent was sent to Afghanistan. As a result, says a veteran, ‘people at home don’t understand what it’s like – the media talk about deaths and injuries, not about our successes’. Gallipoli wouldn’t happen today, say the new generation of soldiers: running into gunfire was rash, lost much and gained little. The modern battlefield is more dangerous, with ‘360 degree risks’, making troops rely on each other more. When an army cook was killed in a ‘green on blue’ attack, says his former senior officer, it made many doubt their purpose for being there, although he wouldn’t let himself ‘fall into the trap of saying our time there was wasted’. An officer of the Royal Australian Engineers, however, says that. just as the World War I Diggers came back with broken hearts, what she saw in Afghanistan and Africa ‘broke her heart’. If Afghanistan ‘has yet to gain public engagement’, as Brown argues, is that because it lacks a Beanist myth-maker, or because of a fundamental conundrum about why we were there? Even the old Diggers, one of them says, weren’t at Gallipoli ‘for King and country’. Every war, an Afghanistan veteran tells Masters, is at first about right and wrong, but eventually that gets confused. In both Gallipoli and Afghanistan, the ex-soldiers agree, survival was often a matter of luck. Some still alive tell Masters they feel luck’s running out. ‘Broken bodies and broken hearts’, Kerry O’Brien soliloquises at the end of Four Corners, offering hotline numbers for people contemplating suicide. What about not doing it all again?